Summer time has always been my favorite. Even as a full time working adult (you know where summer is really just a mythical part of your past you know existed at one time, but now you’re not sure – DID I DREAM ALL THE GOODNESS UP OR WAS IT REAL LIFE – WHY DO JOBS NOT HAVE SUMMER BREAKS), I still love the feel of summer. Sunshine, friendship, breaks to soak in blue water and beaches and boat rides, weekends of laughs and memories, time to look up, cold drinks and books, and deep breaths. For some reason summer makes me want to take a big life deep breath. Last summer was so fun and so hard, a blur of unknowns and oncoming trainwrecks my family knew we couldn’t stop and at the same time it was still full of midnight boating and late nights with friends to distract my heart for a few seconds from the little to larger life blows happening in so many areas. There were laughs in sorrow last year. Grace amidst mistakes. Opportunity to sink deep and explore the deepest and freshest of waters I had ever tasted in the presence of the Lord for relief from life’s circumstances. Good and bad blended together, I remember the hard and scary, but today I smile at the depth carved in my soul. I doubt I would have signed up for the road. It’s not far enough away from me that there isn’t still a sting I feel when I think back, but it ended with a monument built to honor a King who has never left my side. The road is far from over though, so this monument I revisit almost daily for one reason or another to build my faith. It’s where on the hard days pain is exchanged for beautiful purpose to grow his kingdom and expand hearts and open my eyes to the different kinds of pain infecting so many on this earth. This pain I knew existed, but lacked the ability to really know and feel the depth of the heaviness accompanied with it – until now. I had to feel the fullness of the weight to experience the height of freedom. New levels up and new levels down. Summer 2014 changed me because it gave me no option to stay the same. It wasn’t passive in its approach or regarding of my life’s responsibilities. It came full force, stayed, settled, and is slowing finding it’s way back out into the sea of life. It forever changed our shoreline though. What will Summer 2015 bring? I just really didn’t know. I started by chipping away at the 10 books I have purchased and not read. I am so great at buying books. SO GREAT. I am far less great at reading all of them. Summer 2015 is my time to dig in. So I thought. It’s becoming more of a digging up than digging in. Isn’t it crazy how there are so many layers to our soul. Lifetimes of choices and habits and perspectives linking together to our today. Good and bad and messy and chaotic and lovely and memorable. The digging up touches all of it. First up – a beautiful gem I randomly purchased at the suggestion of a random blogger I follow on instagram. 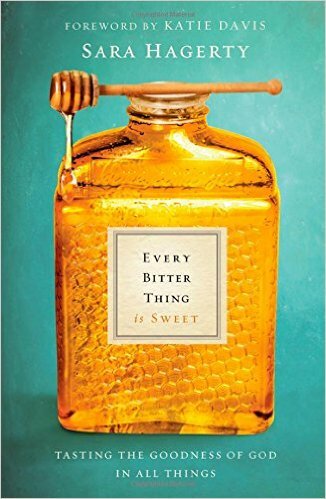 The title drew me in “Every Bitter thing is Sweet – Tasting the Goodness of God in All Things”. Yep, that sounds like I need to read it. Amazon prime’s app & fingerprint pay allowed me to complete my purchase in 2.3 seconds and delivered it to my doorstep in 48 hours. Magical. And boy, did I need to read it. The premise is around fertility and adoption and waiting an eternity for something, demolishing the lies woven into your heart during the wait, and turning the spaces into lakes of fresh water for your soul full of God’s presence and voice. It’s hard waiting. It’s hard tasting pain. It’s hard waiting some more. It’s hard celebrating others when you wait. It’s worth it though. Our head knows it’s worth it, but when pain lacerates your heart you cannot always connect the two. Is there really purpose in all pain? I sure hope so. It’s worth it to keep going for the dream of God for your life – that I know.. It’s worth knowing that you know that you know he is with you in the darkest hour. That truth alone changes you and makes you thankful the road you wish you could rip to shreds has done something in you you have now found immense value in. Only God can do what he does. That pain or wait opens your eyes to knew sights. You can recognize the sting in others then our pain finds purpose. It meets another in solitary or deep valleys. It loves and cares and soothes and reminds the soul to fight – because there is always a dawn coming. Next up – Unafraid. This book was referenced in passing on social media and since I was all “Yeahhhh I’m gonna read so many books this summer” I bought it too in 3.1 seconds on Amazon. It’s about fear, I hope you drew that conclusion yourself, but if not – there you go. You’re welcome. I never thought I dealt with fear. My friends do. I’m constantly telling their spirit of fear – to – go – the – freak – away. But, not me. Then I read the book. Dangit. 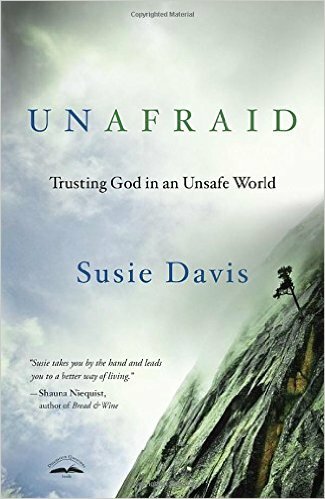 While I don’t deal with a fear that controls my daily life and choices, I had **unknowingly** allowed my past traumas to create a fear (really a lack of trust in the Lord in the unexpected big events) to let little worries become controlling lies. This is a crazy world we live in and fear is a powerful tool used to control and manipulate us and debilitate us. But, His perfect love cast out ALL FEAR. Not some. Not a little baby bit. Not justifiable fear. ALL FEAR. Goodbye. I have spent quite some time soaking in this truth. I don’t have to shrink back and wait for the rug to be yanked, because my Jesus is bigger than that. His peace is greater. His joy never ending and my promise is secure. God is my protector. God is my provider. God is my friend. God is my deepest love. I do not have to fear and I do not have to brace my heart or head or soul for pain. What a truth to live upon in this crazy, messed up world. 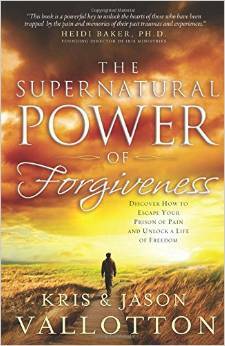 At the recommendation of another friend who repeatedly told me, You need to read this book, The Supernatural Power of Forgiveness, to which I said, “No, I don’t”. I finally picked it up at their house one day and just didn’t put it down for two days till I finished. I didn’t think I needed to read a book about forgiving people because honestly I didn’t know of anything I needed to forgive. Forgiving people or letting them off the hook is not an issue I’ve had. The book is far more about processing pain and experiences than it is about forgiveness though. I was really caught of guard reading it. I connected with so many descriptions and it really painted such a clear picture of the fine balance of allowing ourselves to experience the reality of something in our present or past in order to be healed from it – instead of disregarding it or even just quoting scripture to push there. There are times for that, we are not called to sulk, but the expression of emotion is real and so very good and not to be disregarded as faithless living. It has been a real summer of feels. I’ve found myself busier than ever then all of a sudden by myself for two days in a row. But, the feels are good (well, there not all good) but they are all real. I prayed a few months ago that God’s heart for me in this season would be so clear. I heard him speak clearly and these last few months I know he has taken me on a recovery ride. When life seasons are hard and compact like last summer/year involving every one of the closest people in my life, it’s a balance to make it, to walk in victory, but to also let your heart grieve for the loss and find his purpose in the middle. What’s your summer like? Has it been in a summer of feels or a summer of bliss or summer of discovery? A little of all the above sounds like heaven on earth to me. Also, more book recommendations to come…I’m working on another set of three now.